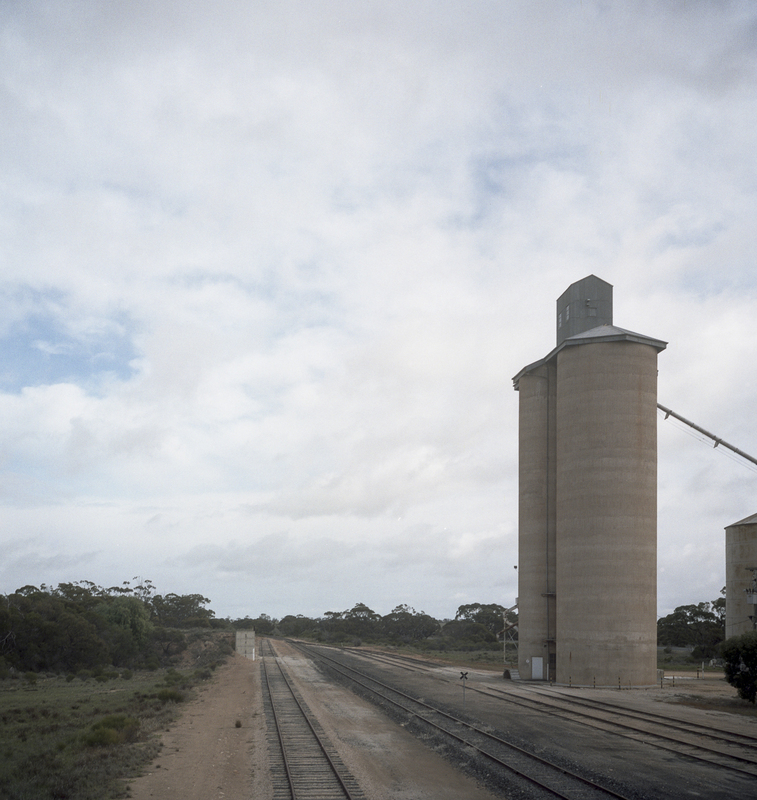 I’ve finally scanned the medium format negatives from the scoping I did for the silo project whilst I was returning to Adelaide from the Canberra trip, as well as those made in the Wimmera when I was returning to Adelaide from being at the Ballarat International Foto Biennale. This project evokes the solitary road trip and cross-country journeys, as a working model of photography without the 35mm “grab-shot” style that captured flux and contradictions of modern life with a fresh immediacy. It is a winter project, given the summer heat in the Mallee. 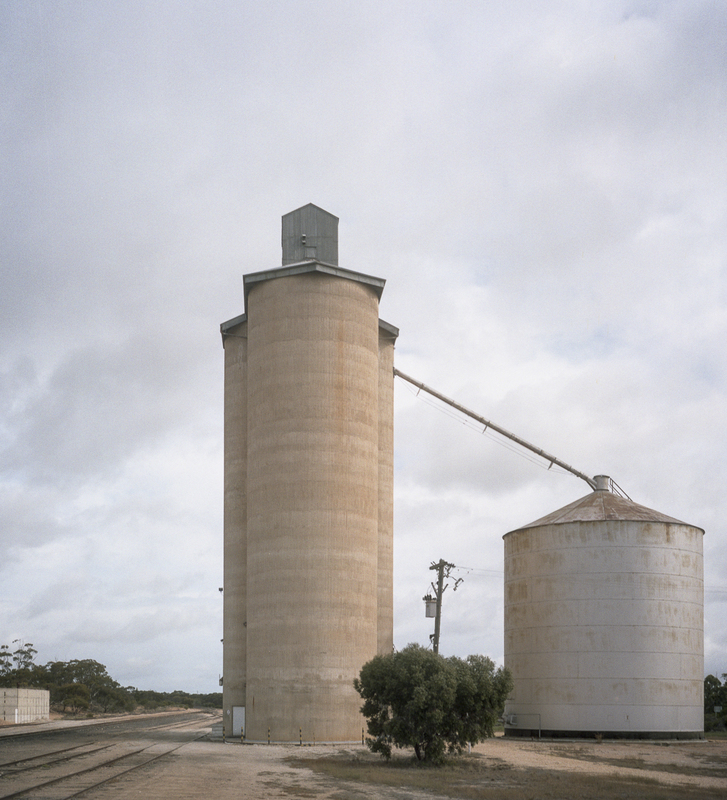 This is an image of a silo at Cowangie, in the Victorian part of the Malle Highway made with an old, mechanical handheld Rolleiflex SL66. The picture that I also made whilst I was scoping with the digital camera at the same time can be seen here. This photography of contemporary, rural Australian Mallee is in the topographical style–an Australian topographics. It is how I would make the picture in black and white using the 8×10 Cambo monorail: straight on to the object, with cloud cover, gentle light and some context to the landscape. I wish that I ‘d taken the picture with the 8×10 then and there; but at the time when I was in the field, I wasn’t sure of the right perspective to adopt. Hence the number of different interpretations I made with a digital camera. I then had to see them on the computer screen to be able to judge which of the various interpretations was the most appropriate. The photograph endeavours to avoid being nostalgic about the Australian Mallee and its fading small farm past to concentrate more on the object. It is akin to the work of Brend and Hilla Becher, with their connection to Minimalism and Conceptual Art and their systematic series or typologies industrial architecture. Their pictures of the architecture (eg., coal bunkers and pit heads) showed a resource industry that was visibly defunct and dying, instead of the glimpses of hope of a thriving, developing nation that was evident in the 1970s American New Topographics. The US curators interpret the topographical style of the 1970s photographers of the post-war American urban landscape who took the built environment as their subject (eg., the influential 1976 New Topographics: Photographs of a Man-Altered Landscape exhibition) as a “documentary style” utilizing a detached stance. Seemingly stripped of expressivity, their photographs were seen to have the appearance of objective or “topographic” renderings rather than subjective impressions. The latter was interpreted along positivist lines as neutral, uninflected, and objective. They were seen to be as aesthetically neutral as real estate snapshots, with the photographs showing the facts without offering their opinions about the rapid development they recorded. Deadpan documentation of banal vernacular architecture as it were. The Becher’s work was in the form of grids of black-and-white photographs of variant examples of a single type of industrial structure—architectural forms they referred to as “anonymous sculptures”. At each site the Bechers also created overall landscape views of the entire plant, which set the structures in their context and show how they relate to each other. Grain elevators were included in their work. The Becher’s industrial landscapes were made on large format cameras, long exposures (f/32 or f/45 at 20 seconds), objects composed in the centre of the picture, the horizon is below the 3/4 line of the object, they composed on cloudy days usually in winter with neutral lighting and the absence of any dramatic effects. They showed these monumental buildings as sculptural forms in the landscape. Is there a tradition of Australian topographics in Australian art photography? Some of the work would exist in the archives without it being recognised as such by the curators or the art galleries. There wouldn’t be much as the topographics approach is now out of fashion (it belongs to the past in art historical terms); and the approach by Australian photographers, by and large, to documenting and interpreting the notion of ‘place’ as a subject has been fragmentary—- in comparison to the photographic traditions in America, Europe or New Zealand. Today, Australian art photographers primarily see place in terms of the city they dwell in, rather than the rural landscape they occasionally visit. That interior landscape is often represented as a mythical Badlands in Australian culture. We can , however, identify two stands in the Australian landscape tradition. On the one hand, there are the stereotypical images of a pastoral, and pastoralist, country in a settler society whose theory and practice of capitalist land use, and its a way of seeing and doing, is increasingly being seen as unsustainable. These types of landscape photography celebrate the conversion of the Australian bush into farmland. The nineteenth century saw photographers produce pictorial representations of the bush that helped to create landscapes that served the interests of colonial power, and then the economic and political interests of a settler society’s property rights and land ownership. Landscape photography renders the land settleable —the landscape was picturesque not inhospitable and so ripe for settlement and exploitation. The second strand in the category of landscape are those touristic and wilderness images of remote or accessible sites made for both the tourism industry (Steve Parish) and the conservation movement’s setting aside‘ of sanctuaries of pristine‘ places (eg., Olegas Truchanas or Peter Dombrovskis). These promote the conservation of the Australian bush. Both strands of the landscape tradition generally work within the aesthetic modes of the sublime, the picturesque (eg., Max Dupain’s pictorialist photographs of Australian people and landscapes) and the beautiful that are derived from the traditions of European landscape painting. So a photography of silos along the Mallee Highway needs to question its own landscape photography traditions in which it is located.